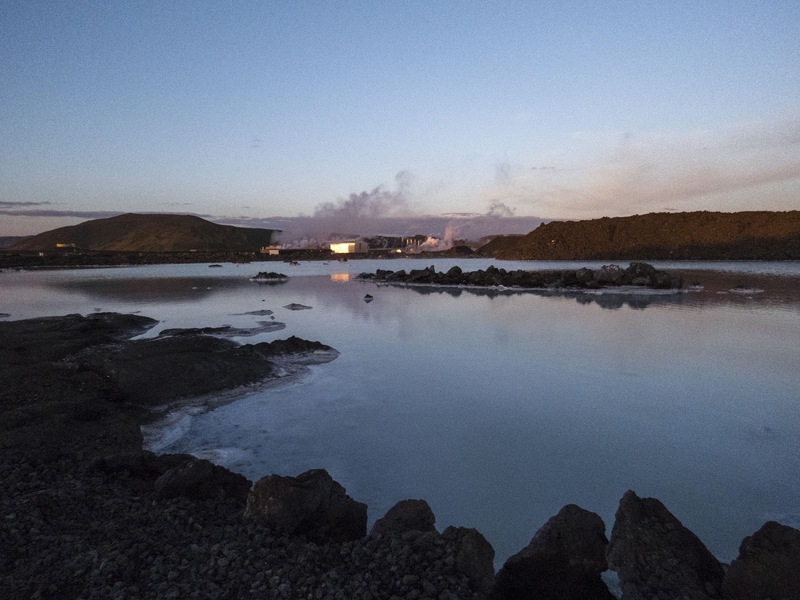 The Blue Lagoon, not far from Iceland's Keflavik Airport, is a world-class man-made hot spring living in the shadow of a geothermal power plant. Now imagine visiting The Blue Lagoon under the midnight sun. This world-famous spa and hot spring is a must-do destination on a late-Spring trip to Reykjavik. I visited the Blue Lagoon once during the day on the way to the airport on my first trip to Iceland over 10 years ago. 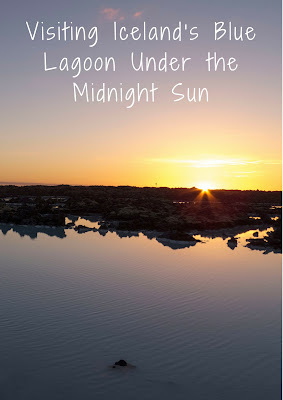 On this trip in early June 2017, we opted to visit the Blue Lagoon a few hours before closing time and had the chance to experience the glowing steamy waters under an amazing sky lit thanks to the midnight sun. Read on to learn more about our late evening visit to the Blue Lagoon. When I visited Iceland 10 years ago for just a few day layover between Scandinavia and the U.S., we opted to take the bus that stops off at the Blue Lagoon on the way to the airport. As you can imagine, many flights leave around the same time of day and other tourists visiting Reykjavik had the same idea to take a dip in the iconic hot spring before flying out. Be prepared for crowds when you visit the Blue Lagoon. On my most recent travels to Iceland (June 2017), we opted to visit the Blue Lagoon in the late evening. The Blue Lagoon opening hours vary depending on the time of year. When we visited in early June, the spa closed at 11:00 pm. We arrived around 8:30 pm and spent a few hours basking in the steamy pools under a magical blue sky. For more information on how to get to the Blue Lagoon from Reykjavik, Wyld Family Travel has got you covered with car, bus, and tour options. The Blue Lagoon is a man-made hot spring and is actually built from the effluent of the geothermal power plant nearby. Despite its industrial origins, the Blue Lagoon feels like you are communing with something 100% natural. The Blue Lagoon seems to glow an iridescent blue thanks to the silicate minerals in the water. The minerals serve multiple purposes. 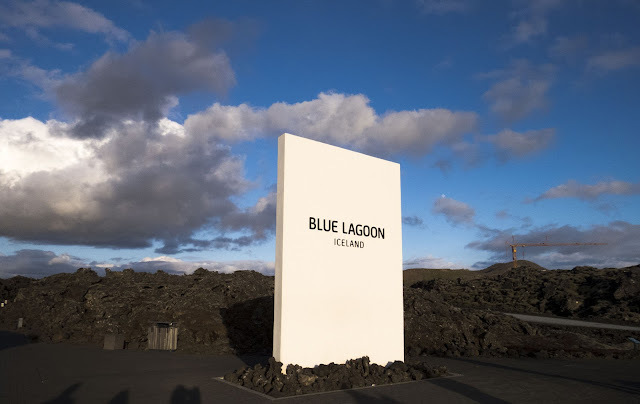 In fact, admission to the Blue Lagoon includes a complimentary cleansing silica mud mask. Some people were brave enough to bring their phones or cameras into the the Blue Lagoon but I wasn't willing to risk my kit being destroyed by the water and steam, so sadly, I didn't get any pictures of us actually taking the waters. 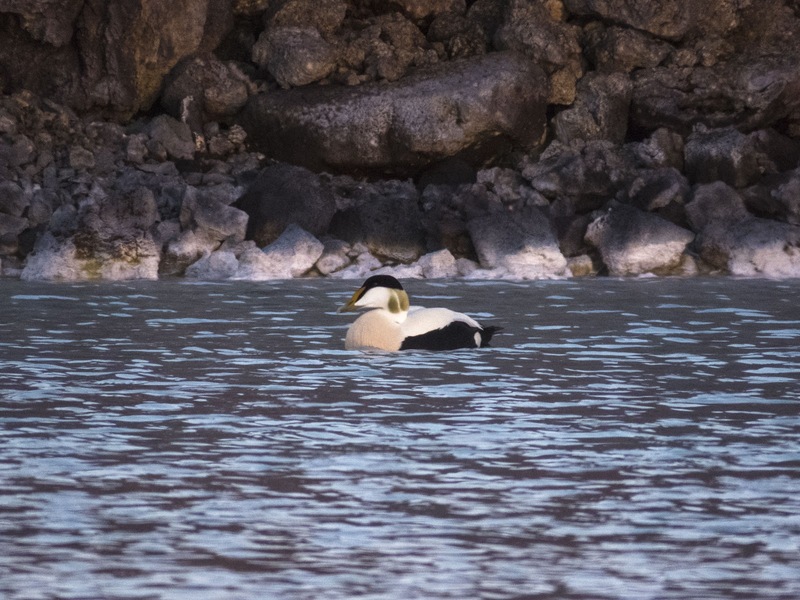 There are some great birdwatching places near Reykjavik. After enjoying the hot steamy waters of the Blue Lagoon, we took a walk around the grounds before heading back to our car. It was 11 pm but no matter, there were plenty of Eider ducks swimming about in the hot springs. I was super-excited to see these avian residents of Iceland. Eider ducks are super distinctive and a great addition to my birding bucket list. 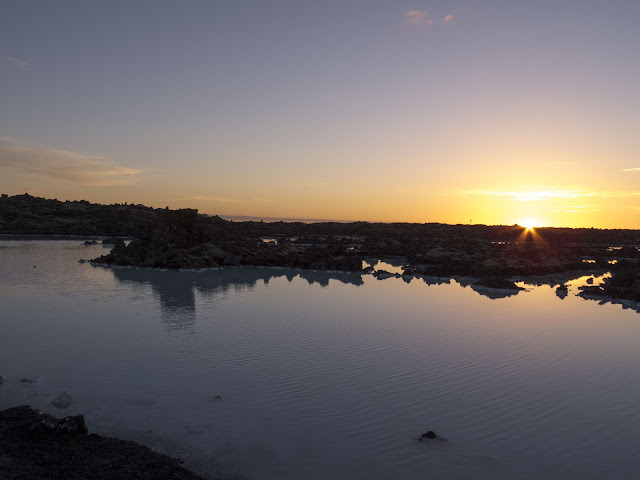 The best part about visiting the Blue Lagoon near closing time in late-Spring is watching the sunset over the hot springs. 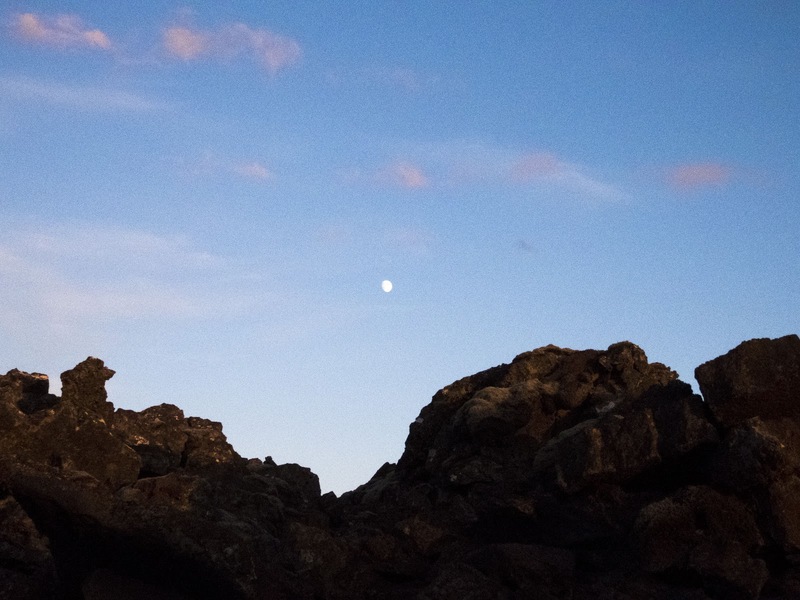 In early June, the sunsets at about 11:30 pm, right after the hot spring closes. 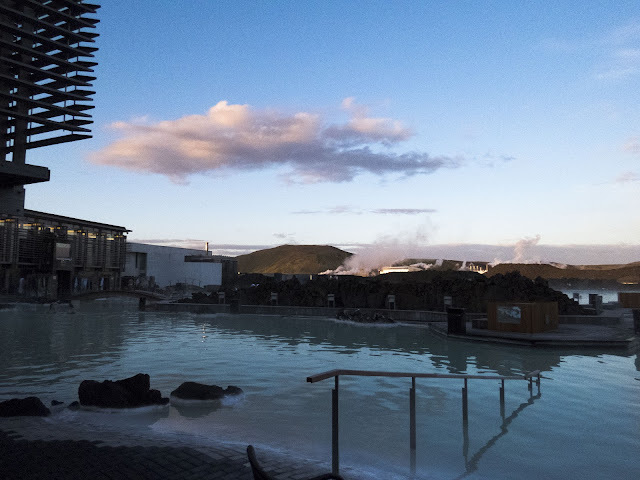 There are additional hot springs outside the paid spa area so we took the opportunity to admire the setting midnight sun over the shimmering water. Stunning! 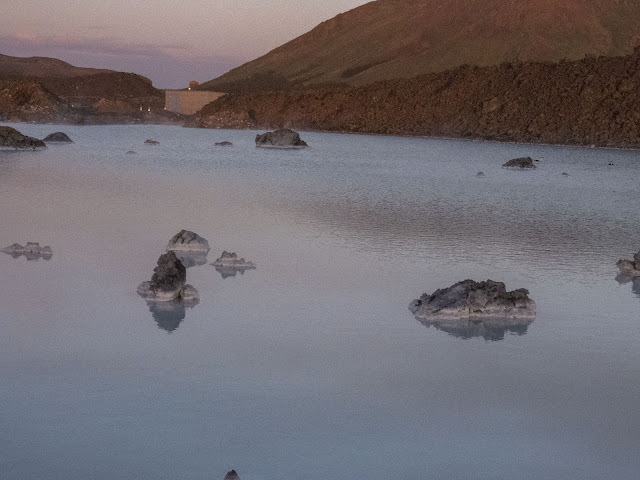 As you can see, a visit to Iceland's Blue Lagoon is an otherworldly experience. The entrance fees to the Blue Lagoon aren't cheap: 6100 ISK (about $50 USD at the time of writing) for the 'standard' ticket (towels and other amenities cost extra) but I'd argue that a visit to the Blue Lagoon should be on your bucket list. If you have plans to visit Reykjavik and Southern Iceland, bring your bathing suit and take a dip in one of the man-made wonders of the world. Learn about the advantages of visiting Iceland's Blue Lagoon spa and hot springs on a Spring evening. A photo-rich post by travel blogger, Jennifer, aka Dr. J, from Sidewalk Safari.